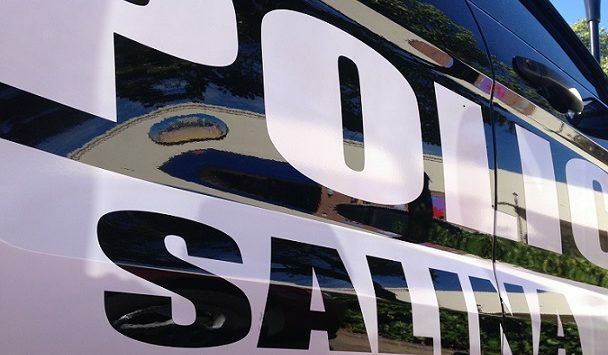 Salina police are in search for a woman who was allegedly involved in a melee with her step-daughter on Tuesday evening and might have stolen a vehicle. Salina Police Capt. Paul Forrester tells KSAL News that the confrontation took place at 1502 Haven Ave. in west Salina. An argument occurred between 23-year-old Kelsie Boyett, Salina, and her step-mother, 36-year-old Valerie Wagoner, Salina. The argument spilled out in to the front yard of the home when it turned physical. Boyett suffered a laceration on the upper-left side of her nose and multiple areas on her head that appeared to be swollen from the alleged fight. During the fight, a pair of car keys that were in Boyett’s pocket fell out on to the yard. The keys were to a 2001 white Cadillac DeVille belonging to Robert Adams, 26, Salina–who loaned the vehicle to Boyett. After the fight, Boyett went back inside the home. Later in the day, she saw that the vehicle was gone. Forrester says that authorities have yet to locate Wagoner or the missing vehicle that is is valued at $4,000. Its tag is Kansas 235-LVJ.